Description: They are the wild and the broken. The werewolves too damaged to live safely among their own kind. For their own good, they have been exiled to the outskirts of Aspen Creek, Montana. Close enough to the Marrok’s pack to have its support; far enough away to not cause any harm. With their Alpha out of the country, Charles and Anna are on call when an SOS comes in from the fae mate of one such wildling. Heading into the mountainous wilderness, they interrupt the abduction of the wolf–but can’t stop blood from being shed. Now Charles and Anna must use their skills–his as enforcer, hers as peacemaker–to track down the attackers, reopening a painful chapter in the past that springs from the darkest magic of the witchborn. 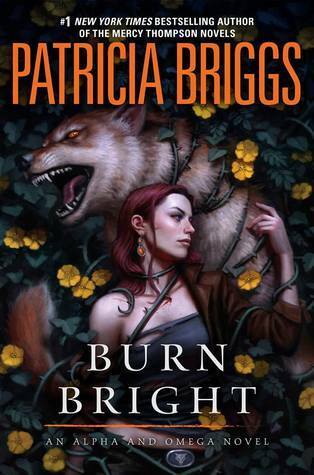 Review: I normally devour a Patricia Briggs' book whenever it releases, but I had a really hard time finishing Burn Bright, her latest in the Alpha and Omega series. Though I loved the world and the characters that Briggs created, Burn Bright is not the strongest book in the series and many things about this book felt off to me. Burn Bright takes place shortly after the events in Silence Fallen, the latest book in the Mercy Thompson series. Bran is away and has left Charles in charge and he is bumping heads with his stepmother Leah. When one of the Wildings (feral werewolves who are too dangerous to be in the pack and who Bran protects) calls warning of danger, Charles and Anna are dispatched to figure out what is going on. Charles and Anna quickly realize that it looks like someone is out to take out the Wildings and potentially the other werewolves. Many characters from both the Mercy Thompson and the Alpha and Omega universe are either mentioned and/or play a vital role in this book. I would not recommend reading this if you haven't read the rest of any of the two series. My main issues with Burn Bright are the uneven pacing and the unbalance amount of information that we are and are not given in the book. My biggest hurdle (and I am not alone) is wrapping my head around the conversation about Bran and Mercy which taints how you see Bran's character as well as his interactions with Mercy. This conversation came out of nowhere and I really didn't feel like it was Anna's and Charle's place to comment on it given their own big elephant in the room conversation about their own futures. After that revelation, the story is topsy-turvey. We spend quite some time being acquainted with the Wildings. Anna deals with big issues of her past that is glossed over and never talked about. She is then trying to use her Omega powers on a wildling which leads us to another revelation and more info dumps that took me out of the story. After a promising start and a drawn out explanation in the first half of the book, the second half is rushed with quick reveals that felt inconsistent with what we know about the characters particularly with Leah. I find it very hard to believe that the big twist was not noticeable to the pack beforehand and the possible plan to undermine Bran. I wanted this to be further explained. I know Briggs had her own personal tragedy with the loss of her husband this year and I'm sure that this has affected the book somehow, but I am optimistic that Burn Bright is a fluke and we will get a much better story in the future. Words of Caution: There is strong violence, some language, and small sexual situations in the book. Recommended for older teens and adults. Yeah the plot to undermine Bran was a little weird. This wasn’t as good as the others. In fact, the last two were a little shaky. I hope she gets back in the groove next time out.